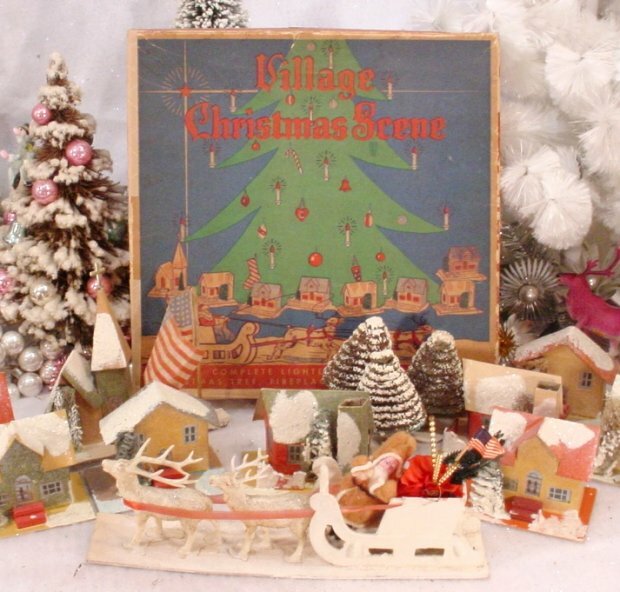 History of Christmas Village Putzes and train layouts during 1930s. 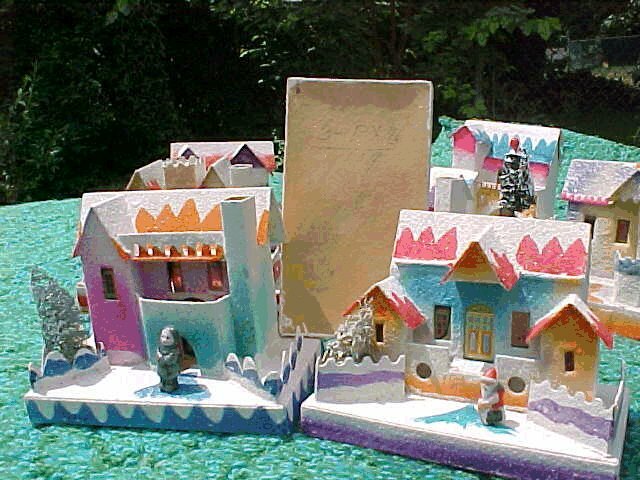 Note: This is an archive of "Papa" Ted Althof's online tribute to cardboard Christmas "putz" houses and their history. At Ted's request, this archive was established in early 2012. Except for critical updates and announcements, it will remain as Ted left it in October, 2012. Silk floss? No...it's finely shredded cellophane! - in colors to match the underlying base. I have often thought that they had them built up to the stage of something like the "LAKKIES" and sprinkled it on while the laquer (or shellac) was still wet. Of all the finishes, the coconut was the loveliest, yet worst-wearing. It's hard to find them in like-new condition. The coconut floss oxides and becomes brittle and just grabs and holds the dust and dirt.It couldn't even be cleaned until Tom Hull discovered his miraculous cornstarch dry-cleaning method. (See the: "REPAIRS and RESTORATION" section.) 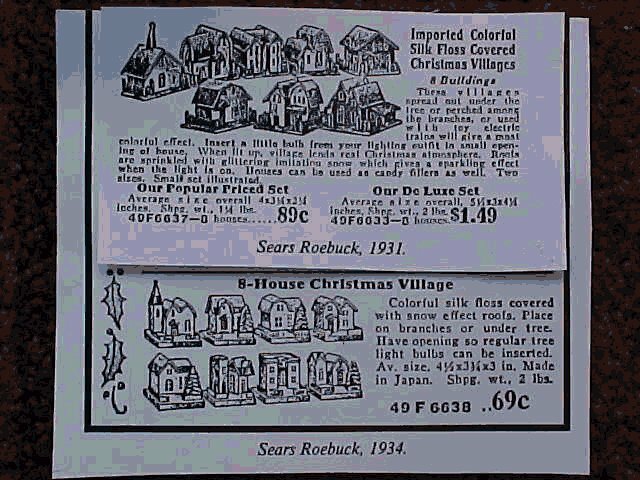 Note that Sears is selling two different size sets in 1931, but has backed off to one small set by 1934 -indicating the really big rage happened earlier. Here is the actual full boxed set depicted in the engraving in the 1931 Sears catalog ad above. 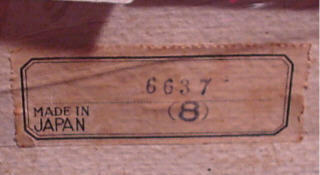 They only show this smaller flat-card based set, but mention a "Deluxe" set as well, which is larger than the set shown in the 1934 catalog. These are what we generally call "Baby Cocos." The smaller have the flat-card bases - the larger have an open box base about 3" by 2".... that is to say, there is no bottom plate on these bases, just the four edges about 5/16" high. Again we have the typical cryptic item no. tag on the setbox bottom, and note that even these tiny little guys have the hole plugs which pretty much disappear by around 1935. 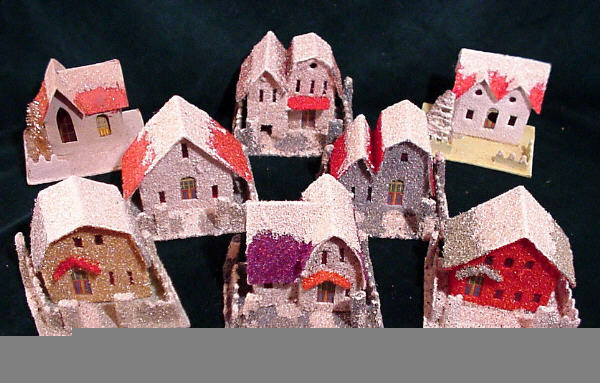 Sets of 8, corresponding to the number of lights in a Christmas string, continue to be the rule up to the "medium" base sizes of about 5.5" by 4" Houses of that size and larger were sometimes sold individually boxed. 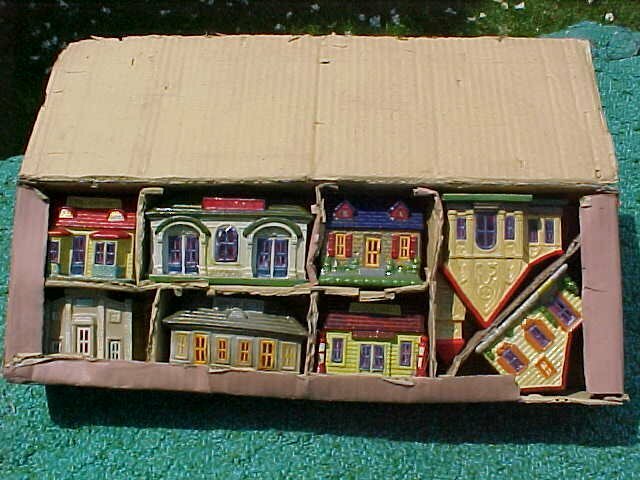 Sets were often broken up as many stores would just discard the flimsy set boxes as shipping materials and set the pieces out to sell. 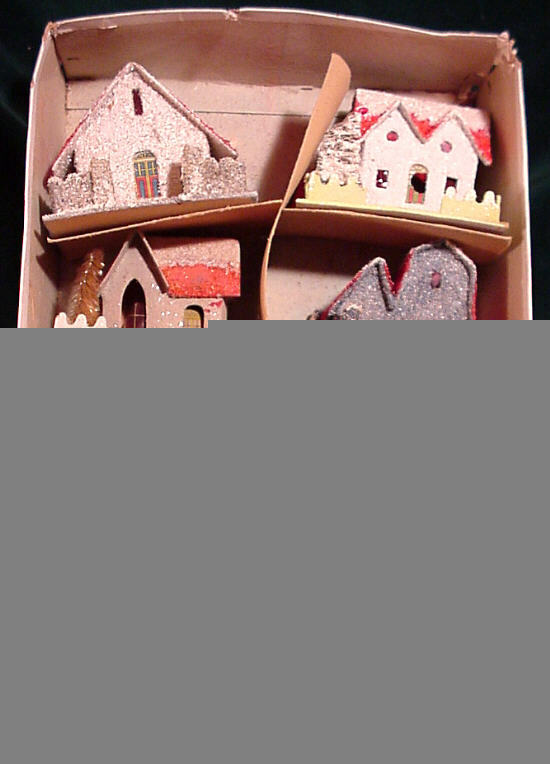 Really large houses often came individually boxed, and more of these boxes seem to have survived. 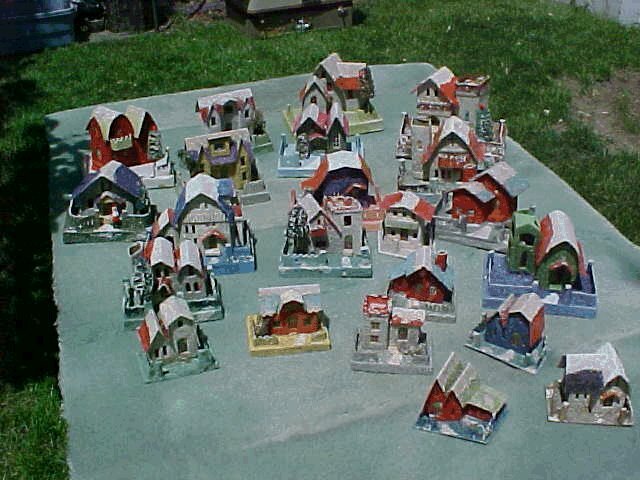 The big mail-order catalogs sold relatively smaller houses for shipping reasons. 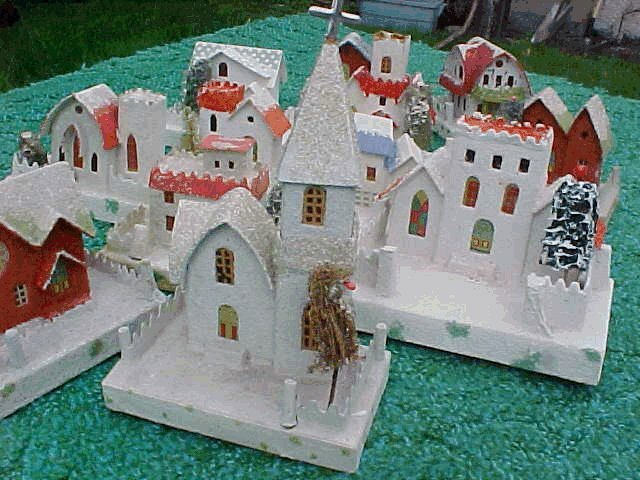 And all collectors have seen the houses shown above. Anything sold by Wards or Sears can be found anywhere in the country. 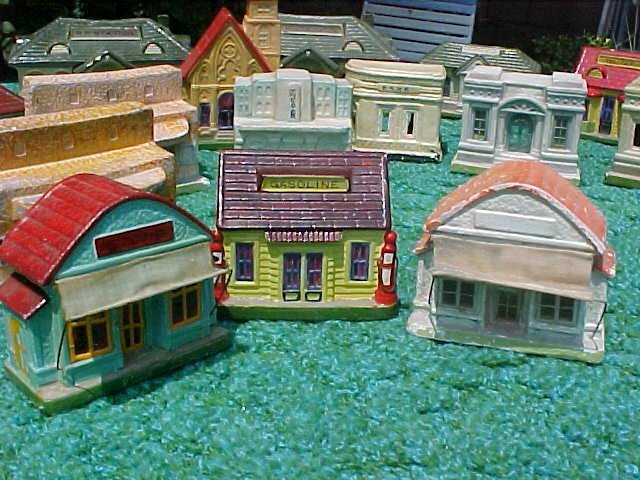 The big, fancy houses came from the Five-and-Dimes, Department, Novelty and Toy Stores. As ever, the biggest and the best and the widest variety was to be found in larger towns and major cities. 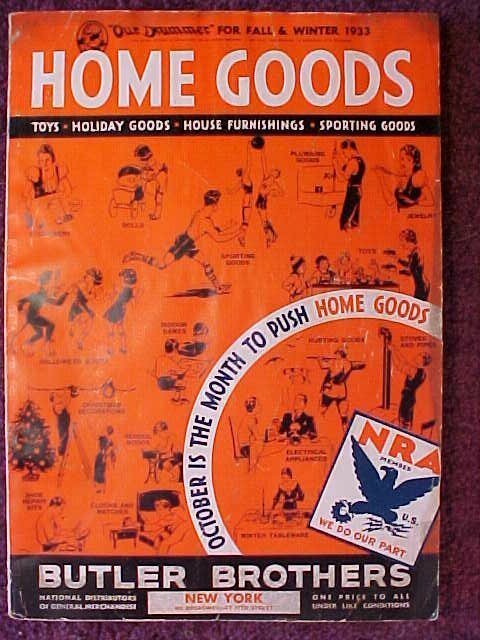 Recently "unearthed," a complete copy of the Butler Brothers of New York 1933 Wholesale Catalog gives great insight into who distributed what products to the retailers, what kinds of things were current at that time and how this part of the business world worked in 1920s and '30s. One terrific find for us all! I used to call them"fuzzies,"or "shaggies" and a few other names - but we owe the term "COCONUTS" to Barbara Lovejoy who has not been collecting long, but has hit the essence of this type, as far as I'm concerned, because that's what new-condition "coconuts" are like - the shredded coconut on pastries and cakes! These are mostly full Cocos - in other words, 100% covered by the shredded cellophane floss. Fences,bases,walls and roof. More houses are found as partials; the whole building or very often just the roof in coco, for example. 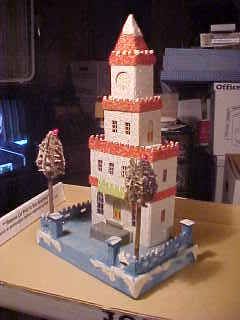 Other parts will be in flat or in sand stucco. 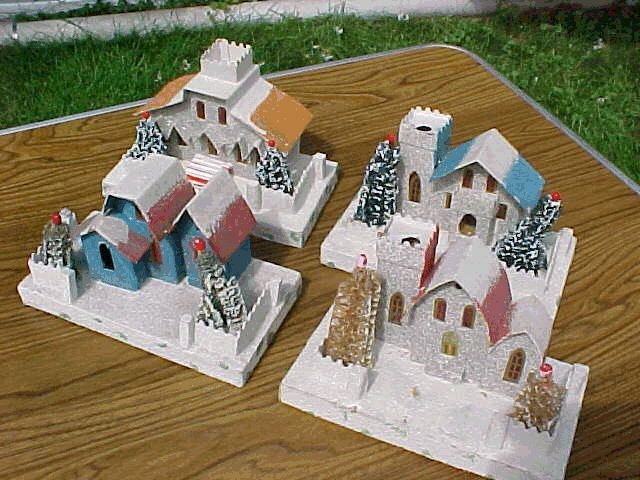 One or two in the background can be seen with sand bases. 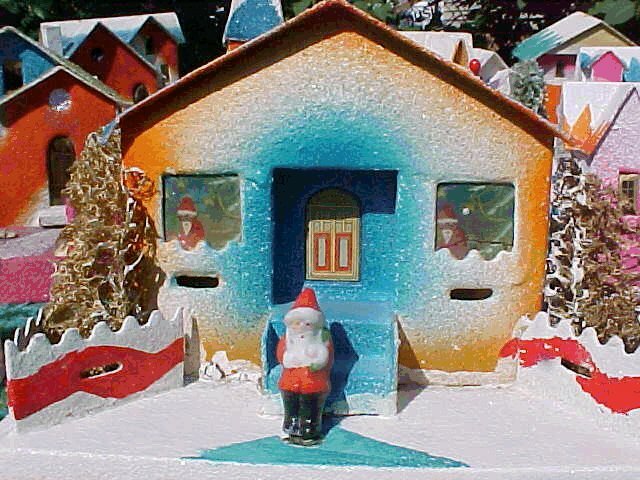 The house in the foreground shows one of the harder-to-find pivoted "candy-filler" hatches on the back, the idea being that you could either illuminate it with a string of lights, or use it as a surprise box. 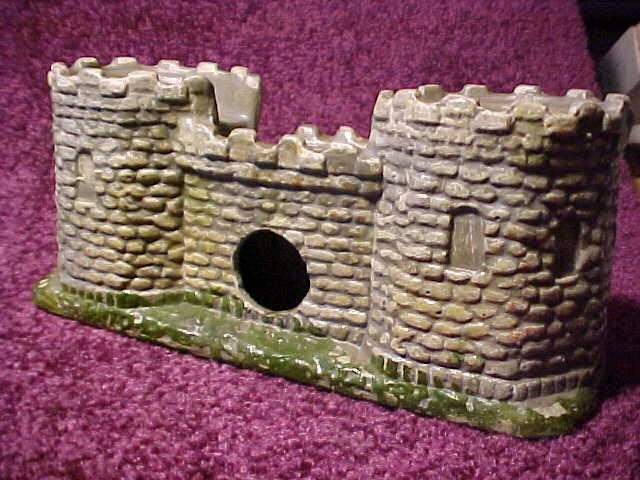 Here is a superb example of an early partial.The roof is coco and the fence post caps. The sides were coco, but painted or varnished over to give a coarse, yet semi-glossy stucco effect. The base is fine sand. Note the fine hand-painted detail on the composition figure.This one is brown material, yet has a wire! This is a terrible picture! I shall strive to replace it. I wish I could show individual shots of each, but space and loading time will just not permit. The idea is that you find coconuts in every size from the tiny sub-mini 1" ornaments to the huge 11 1/2 X 9 1/2" giants and a seeming infinite variety of color and design combinations. This is a Semi-Giant-full coco: 8 1/4 X 5 1/2" base. Everything about this one says pre-war. The style, the windows, the wooden fenceposts. Except it bothers me. It's just too clean, and although it doesn't show well in the picture - gold glitter among the coconut where it is brown.I had thought that only to appear in the '50's, but as usual .. I could always be wrong! GIANTS-prewar I could not believe my eyes when I saw these beneath the tree of a fellow Christmas collector. His wife said they were her mother's. There are three full cocos and a loggie and the bases are fully 11 1/2 X 9 3/4"! Will fully cover a standard sheet of typing paper and more. You can get some idea of the size of these by comparing with the sitting chair in the background. They wouldn't part with them, of course .. Characteristic of the haciendas are these endlessly varied and creative porticoed walls, somehow resembling adobe - and the use of excellent hand watercolor wash to acheive a color gradiency found on no other style of house. Also - the true fired bisque figures first appear with the haciendas and are used generously - found on all but the very smallest. I hold an inner smile while listening to antique sellers telling me that these with figures go back to the 1800's and are especially rare. It's simply not the case. 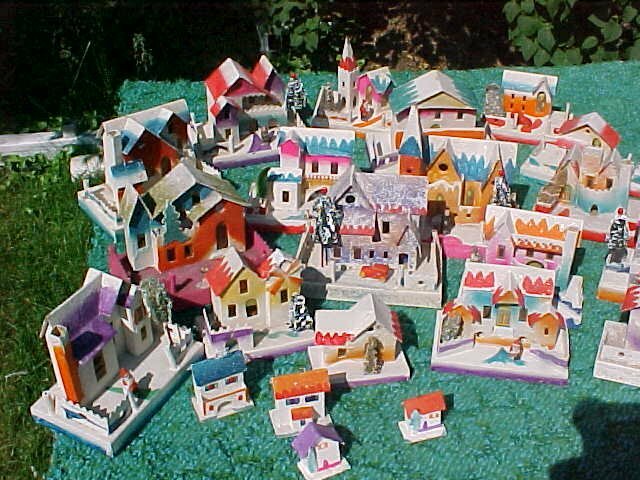 The "Haciendas debut full-fledged in 1935, and most had bisque figures. If you find a hacienda without a figure, look on the bottom; there is probably a hole where the wire originally went through. Some early transitional haciendas can be found quite large with rich detail. Note the intricate hand-painted brick work on this church. It also has a hand-detailed brown composition figure and rafia fence with wooden posts that mark it as an early hacienda. Transitional...the evolutionary step just leading into the full blown hacienda. 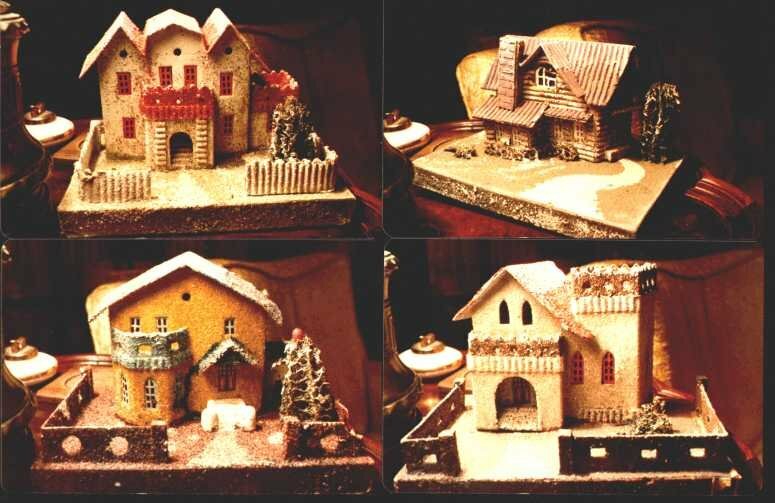 It's fairly thought that pieces like these with the darker colors and features of earlier houses probably begin to appear in 1934, possibly even '33. 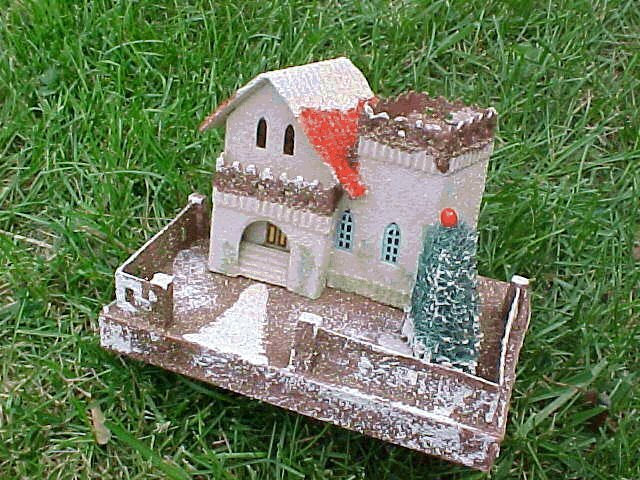 Another early hacienda : unusually dark with an intrinsic cardboard tree, this also had the brown composition figure but all that remains is the pair of "feet" in the front yard. Windmills! - or badly designed aeroplanes? ..."Flying Haciendas," as Tom Hull calls them. (Sounds like a "Fred and Ginger" movie title- and they're right out of that era, too! Certainly, they are flights of the imagination, as were those classic musicals.) 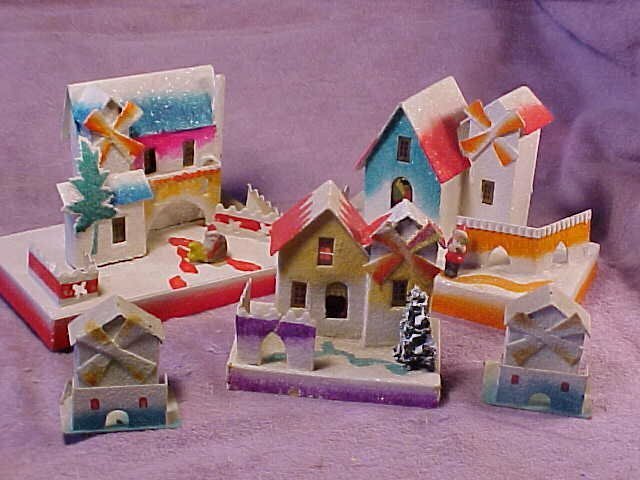 Only the HACIENDAS have these absurd little "windmills." I have discovered only these four types so far, but you never know with the "HACIENDAS." All the PreWar Japanese houses and other decorations have such utterly unique charm! Americans could never have come up with such designs; we are far too literal and realistic minded. You cannot beat the PreWar Japanese for sheer aesthetic innovation. 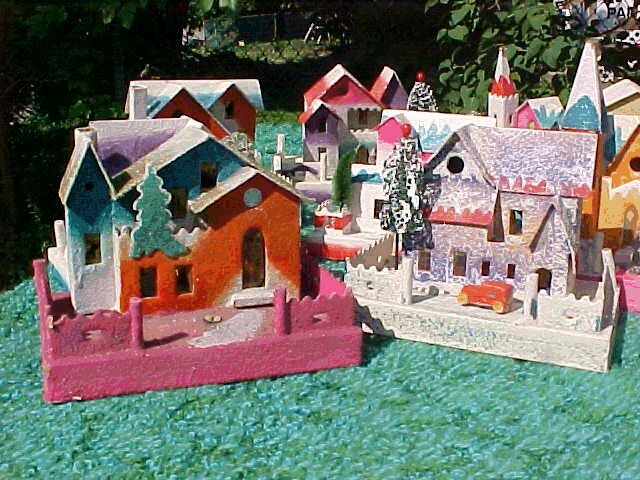 I believe that's what made these houses such a hit and fascination with us. Delight and color and complete cultural surprise! - in the depths of the Great Depression. ....and dirt cheap in the bleakness of those times. Look at the unusual windows! In all my years of collecting, this is the only example of this type that I have seen. It's also a fine example of the water-color wash technique. Among the very best indicators of dating you can get are the price and the way the pricing was put on the bottom. This says "3-Px/10 cts." In pencil. 3 for a dime! Can there be any doubt that this is prewar? Appearing at about the same time as the haciendas, Greenspots are a family as large as the Hacienda clan - a kind of broad, general class of houses characterized mainly by white sand bases with green spots on them. 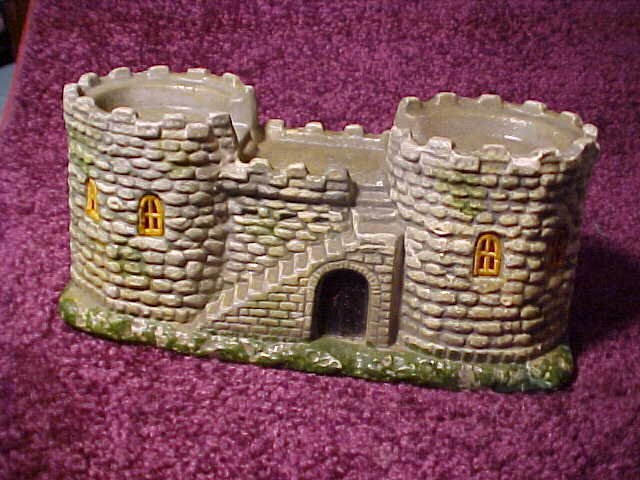 Beyond that, you can find almost any kind of house mounted atop that base, from some of the most equisite and intricate pieces to the plain and boring. The vast majority are pre-war, but they are found from both sides of WWII. Generally speaking - the coconut finished with rich detail and intricate little balconies and railings are Pre-war ... the all plain sand and mica finishes Post-war. Some coconut finish continues to be used on roofs post war, however, and it is sometimes hard to make that call. I go by structural detail, window and door types primarily. 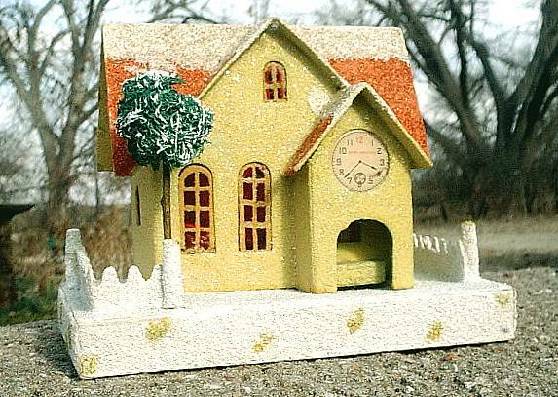 Until just a few weeks ago I thought that all known types of "clock" houses were GREENSPOTS. The knowledge has grown! But all have this same clock-window and all are Pre-War. We now know of 6 types for certain and are pretty sure there will be 7. But - why 3:38??? Ah! Christmas mysteries! However, someone recently told me that Orientals place great store in the lucky numbers "8" and "3," and will pay fortunes to get them on the their phone and license plate numbers. Perhaps that's it. Who really knows? In any case, this simple red coconut is the most common and easily found. It should have a luffah tree like the one below. 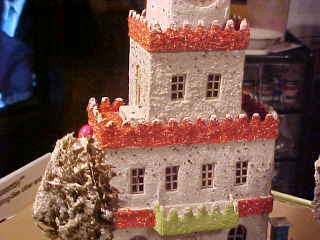 Here is the same house in a white sand finish with coco roof. It hasn't got the porch roof and the fence goes fully round the right front corner, but it's the same house body. Though all white is a characteristic of the majority of postwar houses, this is definitely PREwar because of the gloss-paper mullioned windows. 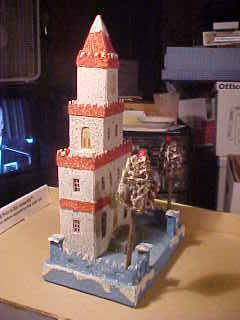 And this one has a luffah tree. These features, and the older red-panelled door, are tempting me to think it may be older than the red full-coco version above. 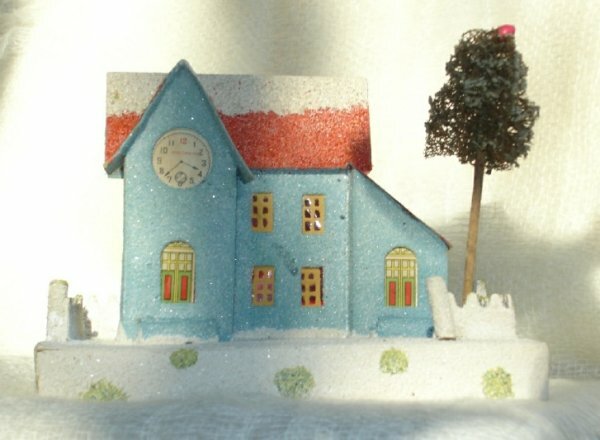 I'm on the verge of calling it a 7th type of Clock House. 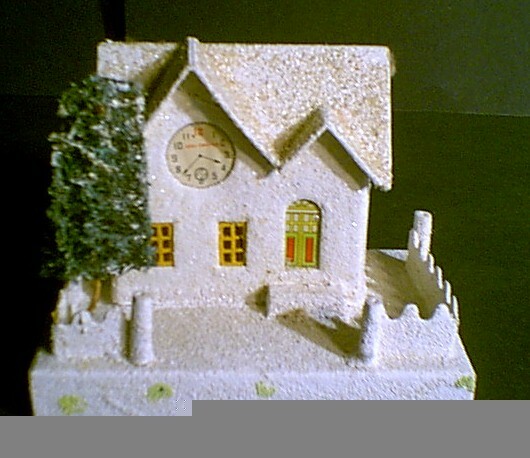 A second greenspot variation having the "Merry Christmas" Clockwindow. The same house after Tom Hull has fixed it up. 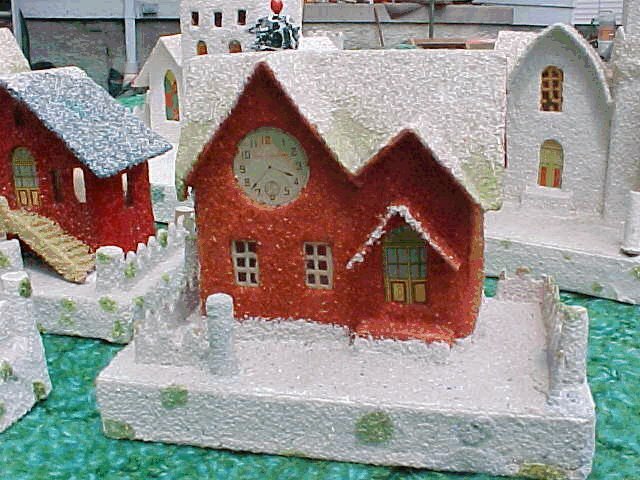 The third known example of a greenspot"clock house. "This is a BIG one! - 7 1/2" wide,4 1/2 deep and 6" high. Collectors call it the "Big Blue." City Hall! - a "medium large" at 7 5/8" by 4 3/4" by 9 1/4" high. Greenspot nearly 10" tall! The full red with green trim coco finish and fuzzy window mullions clearly indicate Pre-war. I have my doubts about that tree, however ......and the snowman, too, but consider your self very lucky if you find one. This is a terrific piece! "High School! City Hall! Not a greenspot! - and very early. Never seen before, but now known to collectors as the "High School," or "City Hall" Clock," This was found just recently without the middle section about 11" tall. It has the older 1929 -'32 slotted fence with square wood posts. I'd go for '32, though, because it has coconut trim. Found in Canada! Here the mid-section has been brilliantly re-created by the owner. Is that amazing or what? Note the doors on both sides of the middle section - and the dual trees. What a find! 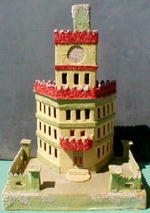 This one is the largest and most elaborate clock house found so far - - also found in Canada. 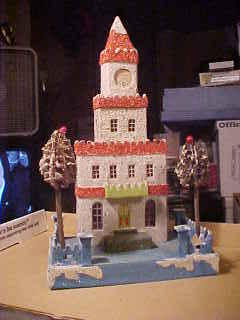 This one is over 12" tall, and also one not ever seen before. It's very early: - NOT a GreenSpot and look at that fence! - of which I'd have said "1930, except that this one also has coconut trim and came from the same collection, so - "1932" - maybe .. 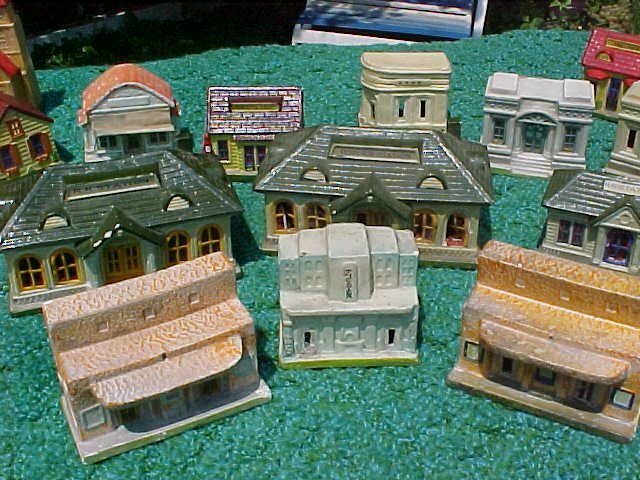 Houses with the late prewar "checkerboard" effect. . found frequently on non-greenspot bases as well. 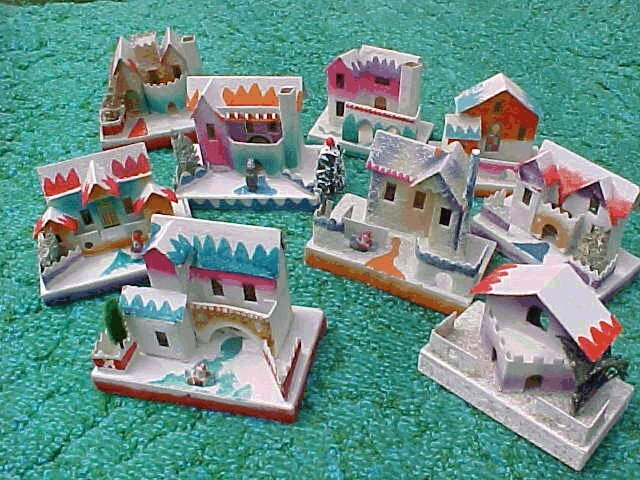 Multis are an odd little side category all their own, occurring sometime in the early to mid -'30's and consisting of two or more tiny ornament sized houses, chenille street lights and a bush or two - sometimes with a snowman - intended to emmulate, I think, a city block. The box bases are longer than usual and narrower. 7 1/2 by 3 1/8 for the triples, here. You cannot really illuminate them. 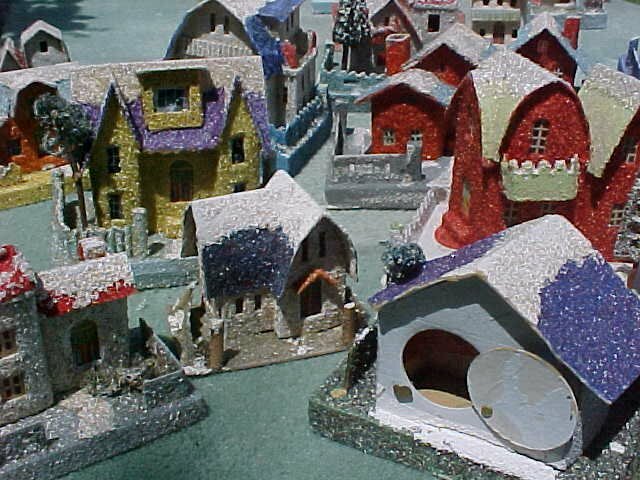 If they have holes at all they are too small for the lights of the time.I like to find them, though.I get a kick out of MULTIS ... sort of the Mesa Verde of Christmas houses. "Nippon," meaning "Japan" in their own language. 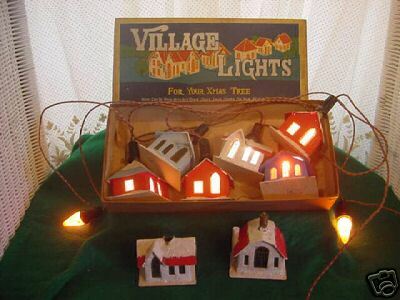 This is another singularity from the '30's: novelty C-6 series light bulbs with mini cardboard houses built around them. 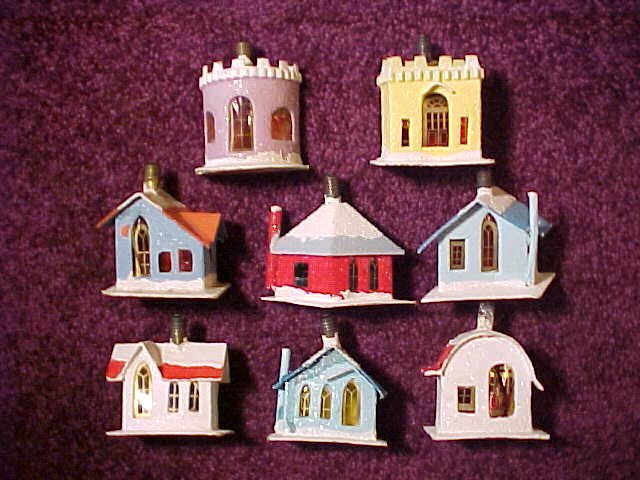 These were first of a long lineage of little houses on light strings to continue well into the '80s. There are only 8 different kinds, and all are shown. ... the standard string of 8 C-6 lights in series. It's hard to find them in working condition. The enclosure of the bulb seems to have raised it's envelope temperature and this would greatly shorten the filament life. Then, it's impossible to replace the bulb without destroying the little house. The bulb was a special long-shank type, too, and the heat was not easy on the cellophane windows. 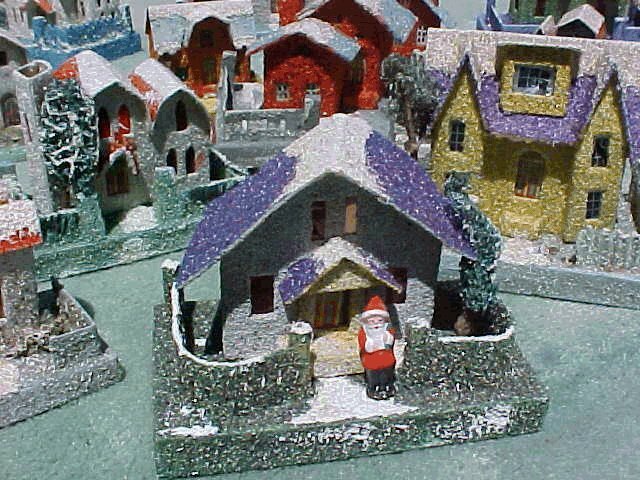 I include them here as they are of interest to both house and light collectors. In truth, they made rather poor tree lights; in the dark all you see are a couple of oddly shaped light sources and cannot see the house. In the light, who needs to have them lit at all? I had never seen a boxed set - well, now I have! This boxed set came up a week ago on eBay. 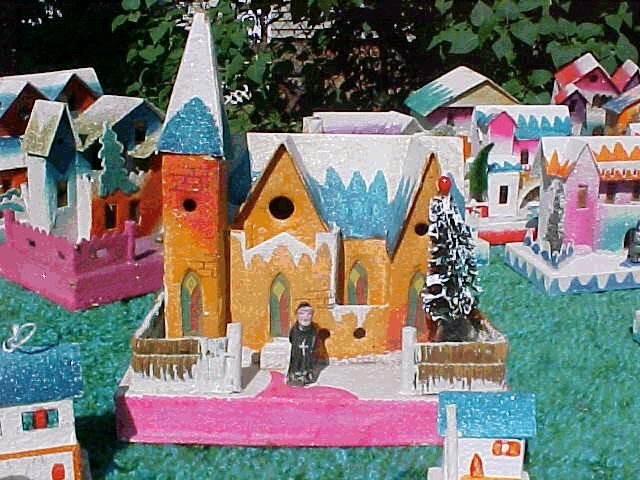 It is my belief that all the cardboard houses we have seen thus far were made by a single Japanese company - probably governing a number of cottage industry shops to produce them. The doors and windows, methods of construction, - just the look and style of everything about them tells me this is so. 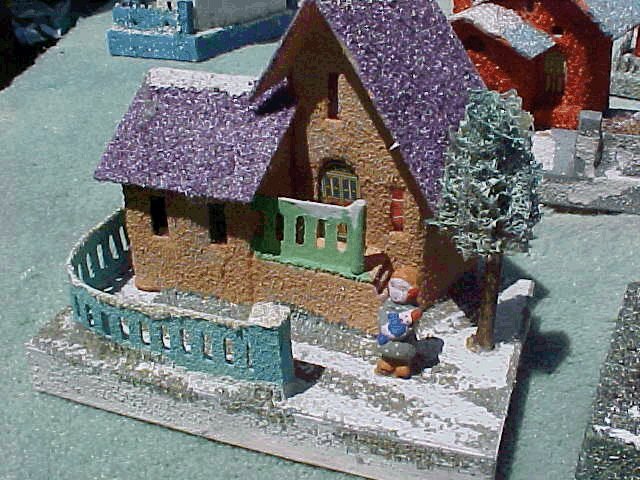 Names like "BLUME" have appeared on some boxes and packaging containing some smaller postwar houses of the same style, construction, doors and windows - almost assuredly made by the same people. But names of this sort have most often turned out to be those of U.S. importers/distributors and cannot really tell us the true origin. Japanese companies tend to stay in business forever. The Stanley Company of Japan, for example, which made so many of the now-collectible Christmas lights prewar - is still very much in business, though making very much more advanced technical things. Even then they were (and still are) the "G.E. Mazda" - or "Philips" lighting and electrical giant of Japan. Late in 2009 the name of "Kanematsu" of Kobe, Japan came to light on a specimen, and appears to be the manufacturing source. Research shows "Kanematsu" as a global corporate giant, also, and into many many things. And they were the same back then. 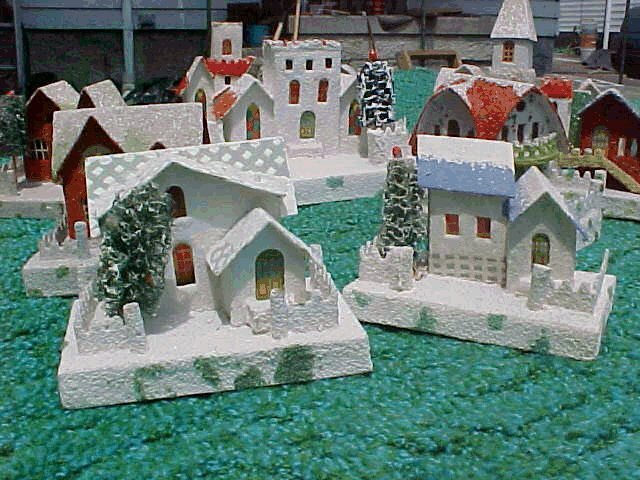 So, the ultimate search for exactly which division made the little houses struggles on, but i think we can at least source them to the city of Kobe in Japan. Though seemingly very different, I don't think the COMPOS were made by anyone else. Contemporaries of the 1930's cardboard houses, they are quite a different thing. 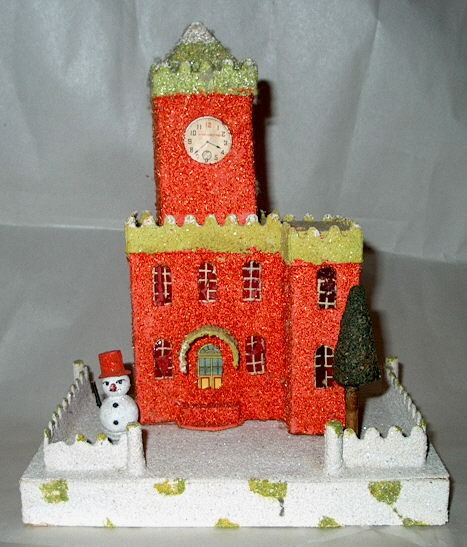 Yet, the type of windows and the basic invention of the hole-in-the-back for string lights are there, so I believe it's the same company, and possibly a company that also made other paper novelties and those compo incense-burners that were popular in the dimestores throughout the year. 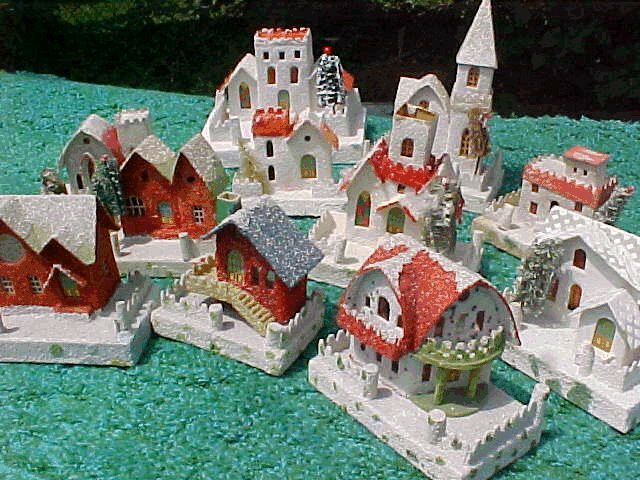 COMPOS, or "composition" houses are actually gypsum, or plaster-of-paris reinforced with a little fiber for strength, though you could hardly call them strong! 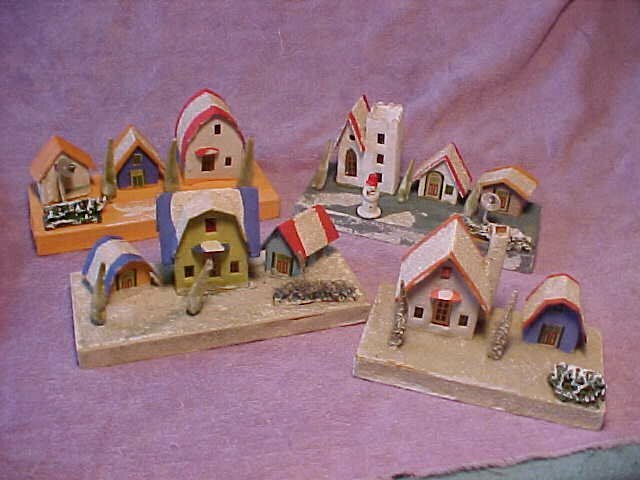 This boxed set of the basic 8 village pieces is over 60 years old, brand new, and there is no company name on the box, which is completely plain and unadorned except for the price: 98 cts.! and the ubiquitous "Made in Japan." Some other COMPOS: Several different styles and sizes of railroad stations , movie houses and banks can be found in addition to the "basic 8. The little rounded "corner" bank is not seen all that often, or I would have a better one to show you! Two examples of the little "store." 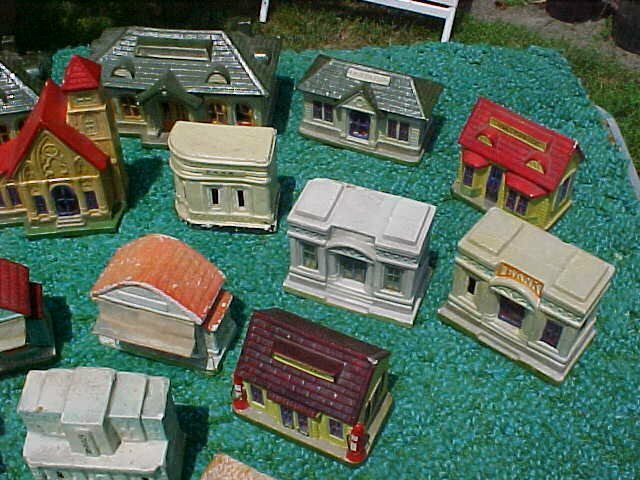 Many of the buildings are found in differing paint schemes. The stores with awnings aren't as common as without. They were made both ways and awnings are usually missing anyway. Quite fragile! The "gas station" has strange little moveable wire attachments, meant to be gas hoses, I imagine. 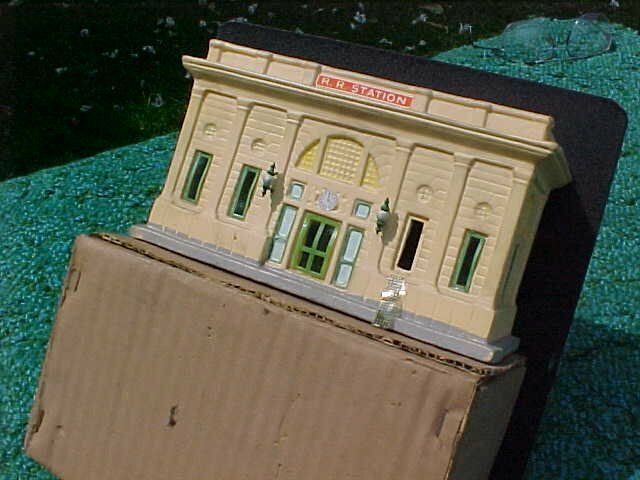 As with the "LAKKIES," it seems quite clear that the "COMPOS" were also intended as inexpensive train accessories. It's especially evident in a set like this and from the high number of different stations, baggage rooms, telegraph offices and so on that you find. One finds these composition "people" and various pieces of this set fairly often in all conditions, but the complete unused set with all 7 figures in the box is seldom seen. Still no company name anywhere on the box. 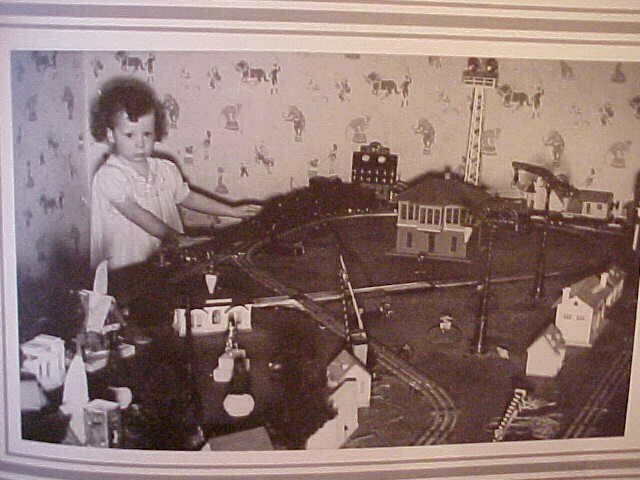 Several of the compos are seen in this vintage Lionel train layout. Just catching a glimpse of one of the 6-wheel trucks of the steam engine's tender tells me this is Lionel's top=of-the line 0 gauge 260E, first introduced in 1930 and catalogued until 1935. The wallpaper fits that era, too. Note that the windows are already gone from several of the compo buildings! 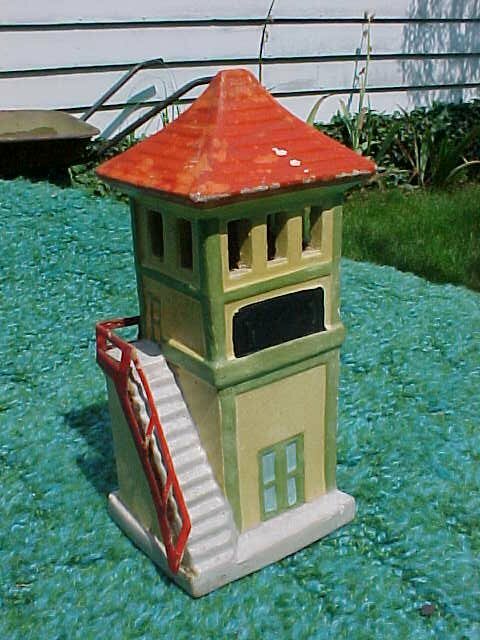 Even harder to find is this railroad switch tower. As far as I know, it wasn't part of any set. Especially hard to find with the delicate paper handrail still present. 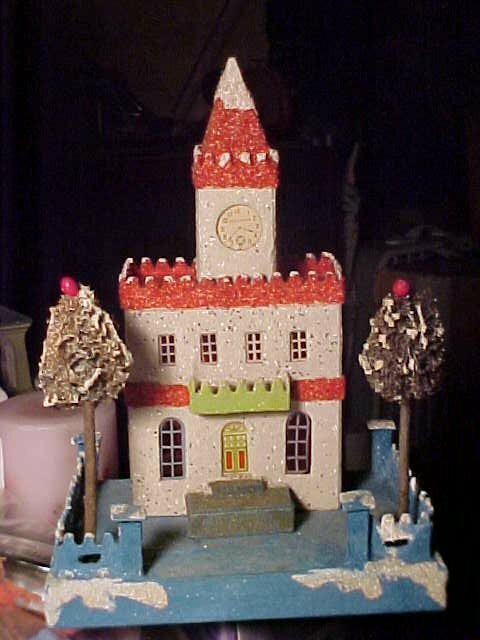 ...and it was meant as a light-up piece, as can be seen by the hole in the back and the paper-framed cellophane windows on the front as seen in the photo above. 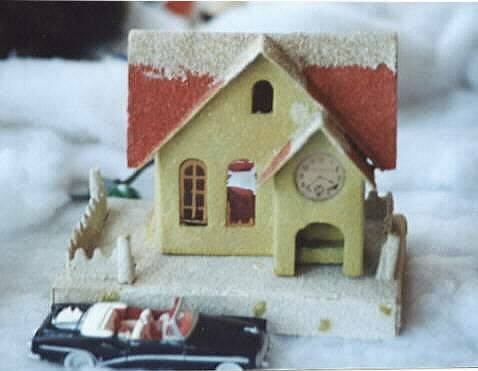 Somewhere in the late '30s, an American Manufacturer of inexpensive toys and novelties in The Tipp City / Cilicothe area of Ohio began manufacturing cardboard Christmas houses - and sets thereof. 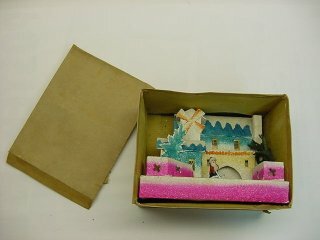 The set and set box and various items shown below are characteristic of their early first style. The celluloid reindeer are Japanese, and Dolly Toy obviously bought these from another source, but the cardboard, art and paperwork is all their own. 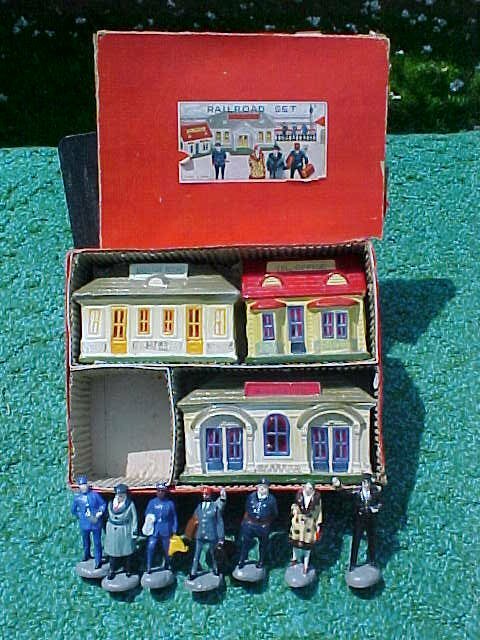 This set had "1939" pencilled on the box. announcements, will remain as Ted left it in October, 2012.